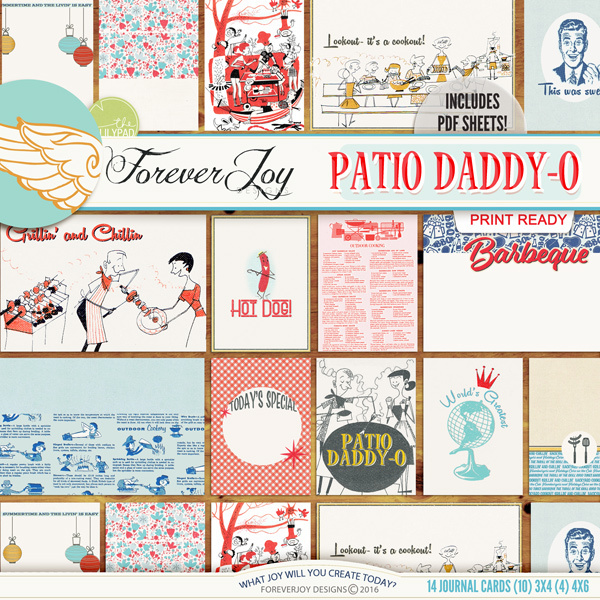 Create Crate Monthly: Rad Dad celebrates that special man in your life, whether you call him Pops, Father or Dad! Be sure to view the detailed previews for the full contents. The kit contains: 33 patterned papers, 13 solid papers, 1 full alpha, 30 word snippets and 99 elements. Here's what's cookin' inside: 23 patterned papers+ an additional 2 solid bonus papers and an awesome collection of pretties including: a checkered grilling apron, grill tools, a badge declaring "King of the Grill", a soda pop cap, two bows, a watermelon banner, 6 brads, a burger, hot dog, and kabob, 3 buttons, 5 flairs, 6 flowers, a kettle grill colored 2 ways, 3 hanging party lights, a leaf, a pitcher of ice cold lemonade and a little lemon slice to add to it, marshmallows to roast, Old Glory, various retro styled stars, 2 bits of ribbon, a secret recipe tag, a juicy little strawberry, ketchup and mustard, a bit of twine, 2 talkies, 3 strips of washi tape, a watermelon slice and 17 pieces of word art. *not all items are shown in preview. Drop shadows for illustration only. This digital kit has been saved as .png files at 300 dpi. Not all items shown. Personal Use Only please. *Layouts below may show the Add-on Patches and Journal Cards which are available for purchase seprately. 20 patterned papers and 5 bonus solids and the following pretties: one delicate doily banner, a bit of picket fencing, a cork stamped arrow, a painted banner, one berry branch, a bingo card (colored 2 ways), 2 bows, 3 brads, a paper butterfly, 3 buttons, a clothespin, a colored doily, 5 flairs, 8 various flowers, a spray of beaded baby's breath, a veneer home, 3 keys, a journaling label (colored 3 ways), a curvy leaf branch, a shabby lit marquee spelling "home", Bingo styled number chips 0-9, 3 painted stamped bits, a paper spool of ribbon, a staple, star stickers, a curled bit of string, a stretch of measuring tape ribbon, a white thread tassel, bakers twine, a vintage styled chipboard typewriter (colored 3 ways) and 11 pieces of Word Art. This item coordinates perfectly with the other March 2016 BYOC products! Drop shadows for illustration only. This digital kit has been saved as .png files at 300 dpi. Not all items shown. Personal Use Only please. Packed inside are one delicate doily banner, a bit of picket fencing, a cork stamped arrow, a painted banner, one berry branch, a bingo card (colored 2 ways), 2 bows, 3 brads, a paper butterfly, 3 buttons, a clothespin, a colored doily, 5 flairs, 8 various flowers, a spray of beaded baby's breath, a veneer home, 3 keys, a journaling label (colored 3 ways), a curvy leaf branch, a shabby lit marquee spelling "home", Bingo styled number chips 0-9, 3 painted stamped bits, a paper spool of ribbon, a staple, star stickers, a curled bit of string, a stretch of measuring tape ribbon, a white thread tassel, bakers twine, a vintage styled chipboard typewriter (colored 3 ways) and 11 pieces of Word Art. This item coordinates perfectly with the other March 2016 BYOC products! Drop shadows for illustration only. This digital kit has been saved as .png files at 300 dpi. Not all items shown. Personal Use Only please. 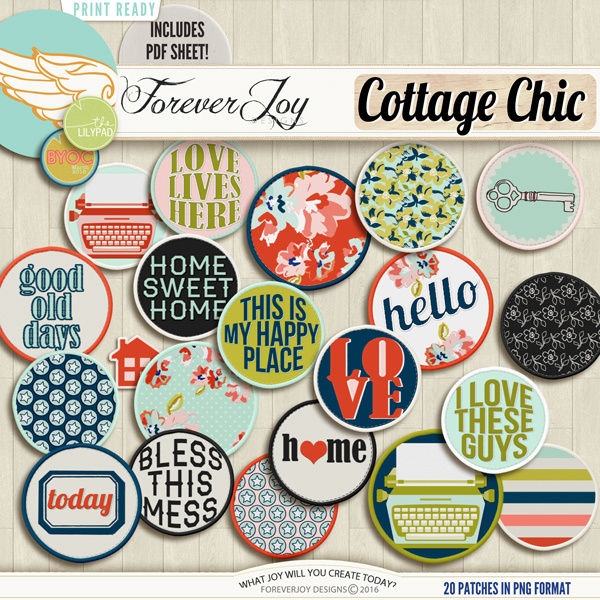 This portion of the collection includes 20 patterned papers (and 5 bonus solids!) 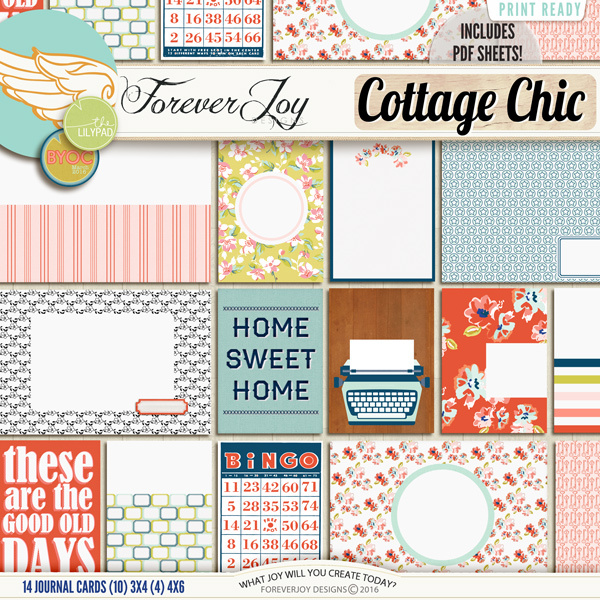 that coordinate beautifully with the cottage chic pretties. This item coordinates perfectly with the other March 2016 BYOC products! Drop shadows for illustration only. This digital kit has been saved as .jpg files at 300 dpi. Not all items shown. Personal Use Only please. What better way to count your blessings than with a meaningful layout? 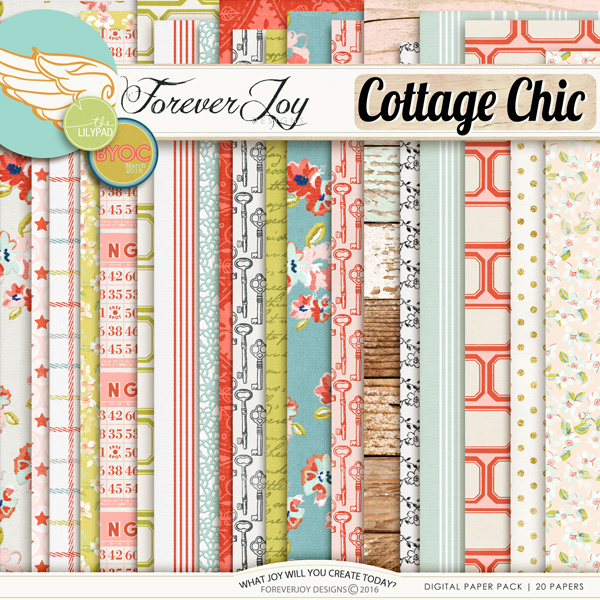 The blessings collection by ForeverJoy is filled with calm hues and warm tones paired with happy pops of color! This item coordinates perfectly with the other NOVEMEBER 2015 BYOC products! Drop shadows for illustration only. This digital kit has been saved as .png files at 300 dpi. Not all items shown. Personal Use Only please. one gold moon to love your little guy all the way to! 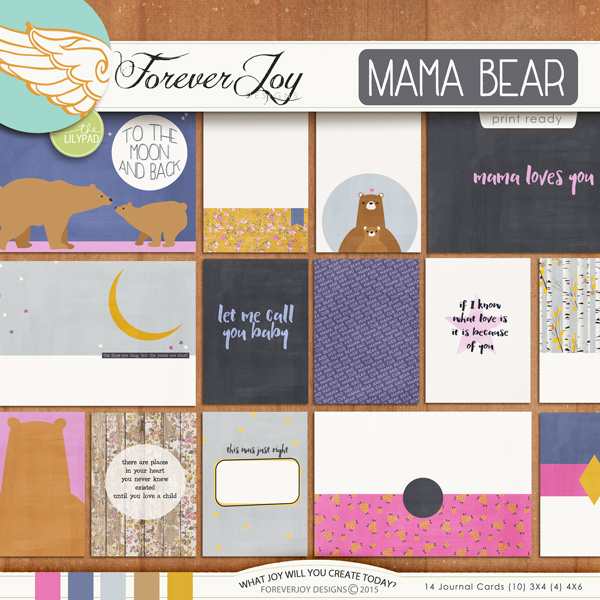 This portion of the "mama bear" collection contains 22 papers- The layouts you see here show the papers playing well with the coordinating Pretties which can be purchased together with the papers as a kit here, as well as the Journal Cards, which are available for purchase here. Drop shadows for illustration only. This digital kit has been saved as .jpg files at 300 dpi. Not all items shown. Personal Use Only please. One of the sweetest stories told is the bond between a mother and her child- and now you can create a mini book of your own to share your story! Simply print, fold and assemble the pages included to create the 3.5x4 inch mini book that is perfect not only for your own memory keeping- but to easily share with others as well. Included are 3 sheets, that when assembled will create a 16 page mini book. Each sheet, as well as the instructions, come in PDFand PSD format. The PSD file has 3 layers: The page to print, the page numbers and then the instructions. This file has also been flatted to a PDF in case you do not have a photo editing program. You can easily drag your photos and digital pretties on top of the pages before printing- or add them the old fashioned way with glue after you have completed your book. Also included is an instruction .txt file as well as a link to the tutorial YouTube Video HERE that explains how easy it is to create! It's a timeless story of love that is repeated in your heart long after the pages may have been turned- a mother's love is always more . The following pretties: A full alpha set (A-Z) and numbers 0-9, 2 arrows, 6 brads, 4 buttons, 2 charms, a set of red epoxy dots, 5 flairs, 8 flowers, 2 frames (each colored 2 ways) , painted heart, 2 painted journal strips, journal sticker (colored 2 ways), 2 leaves, a storybook, painted black dots, painted yellow banner, rub-on of little boys running (colored 3 ways), 2 sets of stars, 3 bits of string, a wood swing sticker, vintage ticket, tree ring with heart in the center sticker, 5 pieces of veneer, a satin vine, 10 pieces of word art, 3 strips of washi and 2 tree rings. The Coordinating Journal cards may be shown in some layouts- they are available separately here. This item coordinates perfectly with the other MAY 2015 BYOC products! Drop shadows for illustration only. This digital kit has been saved as .jpg files at 300 dpi. Not all items shown. Personal Use Only please.